His early passion was rockabilly and he performed in many bands which played those sounds during the late 1950s, playing bass in a band known as The Vegas Kings, eventually calling themselves Ronnie and The Red Caps once Dio took over as their lead singer. They even released a single, “Conquest”, an instrumental ala the sounds The Ventures were doing and the flip side “Lover” did not have Dio on main vocals, but on backup ones. Their second single, “An Angel is Missing” with the B-side of Ray Charles’ classic “What’d I Say” found Dio on lead vocals. The band went through another name change, Ronnie Dio and the Prophets, and even released some singles on Atlantic Records. It was during this time that Padavona changed his last name to Dio, after the mafia member Johnny Dio, and started to be known as Ronnie Dio by the early 1960s. The band went through one more final name change as the decade wound down, calling themselves Electric Elves, and then finally, shortening that to simply Elf. By this point, the sound had changed also, so had the tastes of the pop cultural climate, and Elf shifted gears as well to accommodate the harder rock feel coupled with the folksy mellow vibes that was apropos during that era. This found the band becoming an opening act for the legendary British hard rock quartet Deep Purple, while also recording three albums. 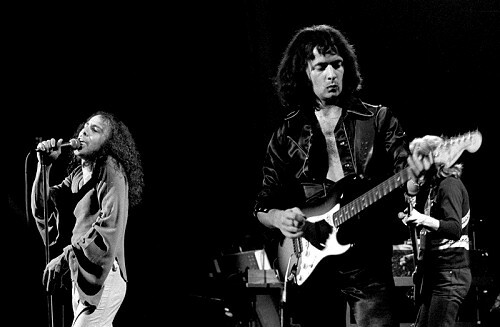 The lead guitarist of Deep Purple, Ritchie Blackmore, left that band by 1975. Always keen on Dio’s vocals in Elf, he formed the band Rainbow and got Dio to be the front man. Rainbow released 3 albums with Dio singing lead, (Ritchie Blackmore’s Rainbow, Rainbow Rising, and Long Live Rock and Roll) and showcased Dio to a much wider audience, as heavy metal and rock fans discovered for the first time the powerful attack of Dio’s singing. All three albums rocked with a fervor, and Dio was the perfect fit for the intense, bone crunching attack of the sound. Rainbow released one more record with him, the live album On Stage, before parting ways, as Blackmore wanted to take the band down a more commercial path, more into the mainstream, something that Dio ultimately avoided and abhorred. By 1979, he joined Black Sabbath, replacing Ozzy Osbourne, a key figure in making that band one of the doomiest, most heaviest and influential pre-metal bands of all time. They released the classic Heaven and Hell a year later, which was successful, but definitely and decidedly took the band to another direction with their new singer firmly entrenched within, as the ominously doomy sounds were replaced by Dio’s more lighter, mystical feel, yet still hard rocking approach. It was also during this time that Dio popularized the “throwing horns” hand gesture that pretty much became his trademark and was generally attributed him in the hard rock/heavy metal genre, although other artists had used it before he did (the cartoon image of John Lennon on the cover of The Beatles’ Yellow Submarine is “throwing horns” and George Clinton and Bootsy Collins also used it in the funk band Parliament-Funkadelic). He stayed with Sabbath for another release, Mob Rules and then also jumped ship from that unit when creative differences over the mixing of the live album Live Evil splintered the band, leading to Dio and Sabbath’s drummer at the time Vinny Appice, forming Dio’s first solo venture in the heavy metal/hard rock genre, Dio. The debut album from his self-titled group, Holy Diver, was released in 1982 and included the hits “Rainbow in the Dark” and the title track. Dio as a solo act/band released ten albums, with constant personnel changes. Only its lead singer remained the constant through that tenure. In 1985, taking cues from the musical charity supergroups USA for Africa and Band Aid, and his fellow solo band mates, was involved in a project called Hear’N Aid, which raised over 1 million dollars for charity. As the 21st Century came in, Black Sabbath reunited with Dio on vocals and Appice on drums, calling themselves not Sabbath, but Heaven and Hell. The band toured successfully and an album released during that time, The Devil You Know, was critically and commercially successful as well. Dio also appeared on many other projects as well during his career, including 50s crooner Pat Boone’s easy listening versions of heavy metal classics, which was titled In A Metal Mood: No More Mr. Nice Guy and released in 1997. Dio showed he had a sense of humor by singing back up vocals on Boone’s decidedly different almost muzak rendition of Holy Diver. Tenacious D recorded a song named after him, affectionately called “Dio” in which the genuine article approved of, and returned the favor with a memorable coming off of a wall poster appearance in the their film, Tenacious D and The Pick of Destiny in 2006. As 2010 began, Dio showed no signs of slowing down. 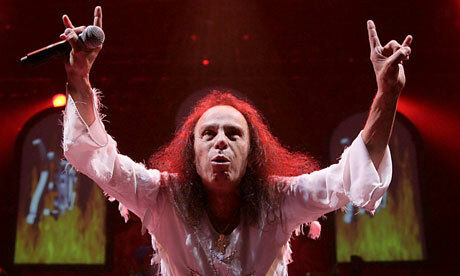 Now 67 years old, he was all set to go with another summer tour with Heaven and Hell. He had been diagnosed with stomach cancer the previous year, but immediate treatment at the esteemed medical center The Mayo Clinic and the support of a fan base around the world, seemed destined to be something that would help Ronnie James Dio to successfully beat that potentially terminal illness. But it was sadly not to be and on May 16th, 2010, he passed away, to the shock and sadness of his family, friends and millions around the world. They lamented the passing of a hard rock icon, who seemed like a genuinely nice all around human being, who gave so much passion and fire to his craft, his music and his scores of fans. The void left by his passing is like a giant crater in the landscape of heavy metal and hard rock, which over two years later, still remains. Dio remains one of the great voices of a genre that amped up rock and roll, took it to new levels and dressed it in leather and denim, shook up a pedestrian music climate and gave its own code to so many people young and old, like a secret club that continues to this day. Great artists come and go sometimes like faceless robots through a revolving door, but the true ones stick around. They come in to the world and may exit with their physical deaths, but they never leave. Ronnie James Dio was someone who will never leave. Let’s all pause for a moment today to remember and celebrate the birthday of the great front man of so many classic ensembles, a titan in his field and a master never to be forgotten.